The cost depends on the size of the monitor screen, whether the images are black and white or color, and the amount of magnification. To insure the best selection, talk with an eye doctor or low vision specialist. When Millie wanted to find out if this machine could really help her, a representative from Optelec came to her apartment and demonstrated it. If you want to know if the machine is right for you, a representative will bring it to your house and show you how it operates. The web site is www.optelec.com and the phone number is 800 826 4200. Another machine to check is Enhanced Vision. www.enhancedvision.com/ The toll free number is 888-811-3161. They, too, offer a no obligation in home demonstration. The text – to – speech feature might appeal. Both machines have this feature. Currently Medicare doesn’t cover the cost of low vision devices. It’s important to make sure the device can be returned for no cost if it doesn’t meet the needs. Some state societies for low vision can be a source for secondhand devices. “My machine helps me remain independent,” says Millie. 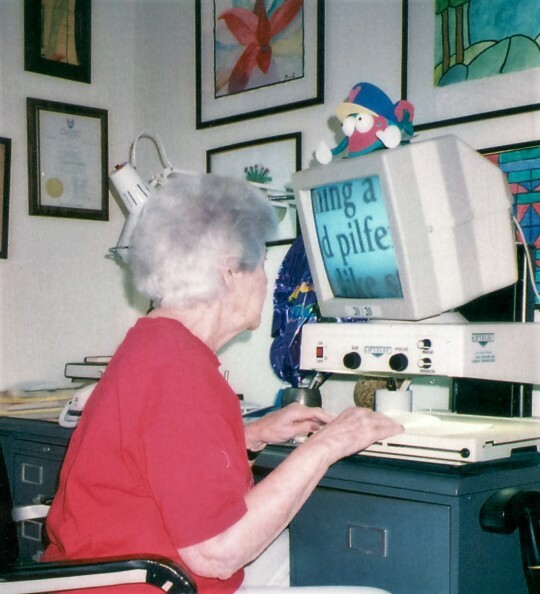 “I bet I use it four or five times a day.” Besides reading her financial statements, Millie uses her machine to read her mail and labels on food cans. Instead of opening a can of soup and not knowing what kind it is, she checks the label with her magnifying machine. Millie can even read the small print in a phone directory. It’s a slow process because enlarging the print fifty times means only a few words can come up on the screen at a time. Some phone companies offer free 411 calls for their sight impaired customers. You will know if this service is available by calling 411 and asking.